El Ayuntamiento de Pamplona ha dado a conocer los conciertos que compondrán el programa musical de Sanfermin 2016 en los diferentes espacios del centro de la ciudad. Pamplona City Hall has just released the concert program for Sanfermin 2015. Among the musicians coming are Mario Vaquerizo with las Nancy Rubias, Boni, Medina Azahara La MODA (la marvillosa Orquesta del Alcohol), Miguel Campello, M-Clan, El puchero del hortelano, Siniestro Total and Play de Game (Tributo Queen). 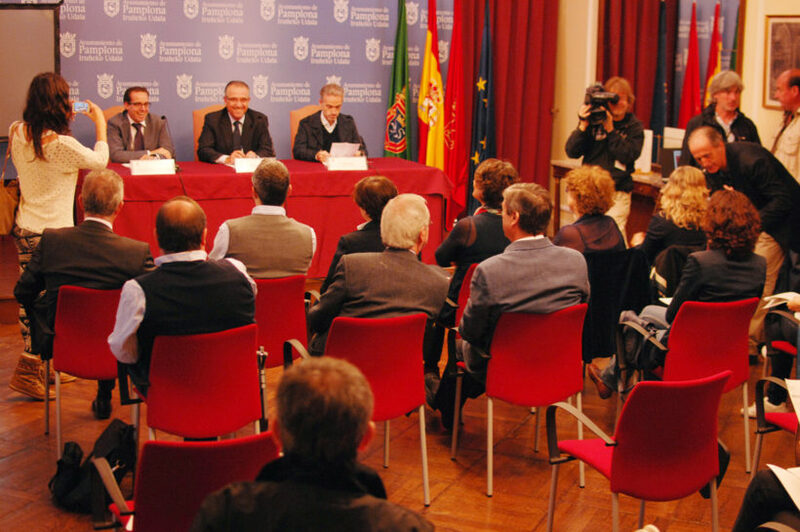 The budget outlay for the music concerts at the Plaza of los Fueros is 200.000 euros and for the Plaza del Castillo main square the figure is 110.000 euros. This serves to confirm that, yet again this year, the Plaza of los Fueros is becoming the main venue for concerts over these past few years. In the Plaza of los Fueros the performances from the main groups and bands are programmed to begin at 00.15 a.m. although most nights there will be supporting groups playing from 23.30 p.m. (as soon as the nightly fireworks displays finish). In addition, between 21.30 and las 22.30 p.m. there will also be music playing, either with DJs or with music groups and other music artists, as has been the case during these past years. The Plaza del Castillo main square is programming music performances of a different style and in contrast to the shows in the Plaza de los Fueros and it includes a wide range of styles for all those who enjoy the festive nights in the main square during the Sanfermin fiestas. 6 of july (see complete program): Play de Game (Tributo Queen). 7 of july (see complete program): La edad de oro del Pop Español. This coming weekend the fiesta popularly known as Sanfermin Txikito or Sanfermin Chiquito (‘The Small one’) will be celebrated. As the name would indicate, this fiesta is held in honor of San Fermín, but in a smaller way than the big fiestas held in July in his honor. Perhaps also considered ‘small’ because there is no running of the bulls (there used to be up to 1993) but the fiestas are ‘Big’ as far as partying and celebrating goes, especially around the old quarter of the city and not all over the rest of Pamplona. And there are historical reasons for this as both the religious fiestas and the municipal and popular ones are circumscribed only within the historical part of the city. As with everything related to Sanfermin there is clearly just one fiesta, but within the ambience of fiesta there are various approaches taken by different agents. For a start, there are two religious celebrations. 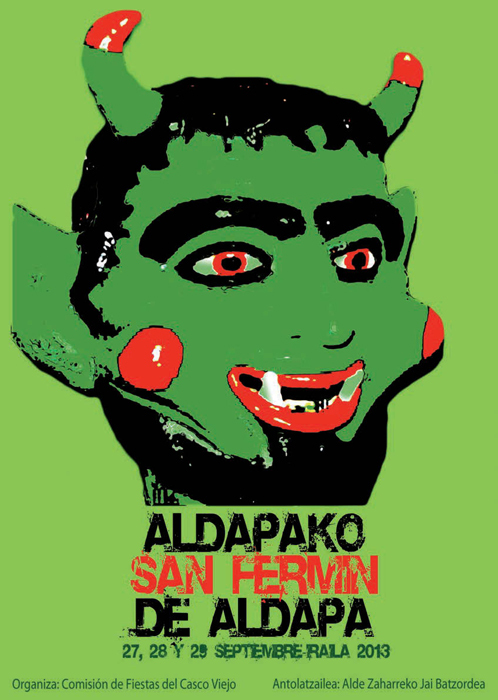 On the one hand, this coming 25th of September the parish church of San Lorenzo will celebrate the martyrdom of St. Fermín. The chapel within this church hosts a service of nine days a religious service which remembers and honors his martyrdom. The 25th of September is a Wednesday this year and this is the day marked by the holy church to remember this event. This celebration is presided by Juan Antonio Aznárez, auxiliary bishop of the local diocese along with the choir of San Lorenzo. On the other hand, on Sunday 29th at 11.30, in the Basilica of San Fermín de Aldapa, there will be a religious function held and the image of the saint which lies in this church will be taken out and paraded through the streets as is done each year. 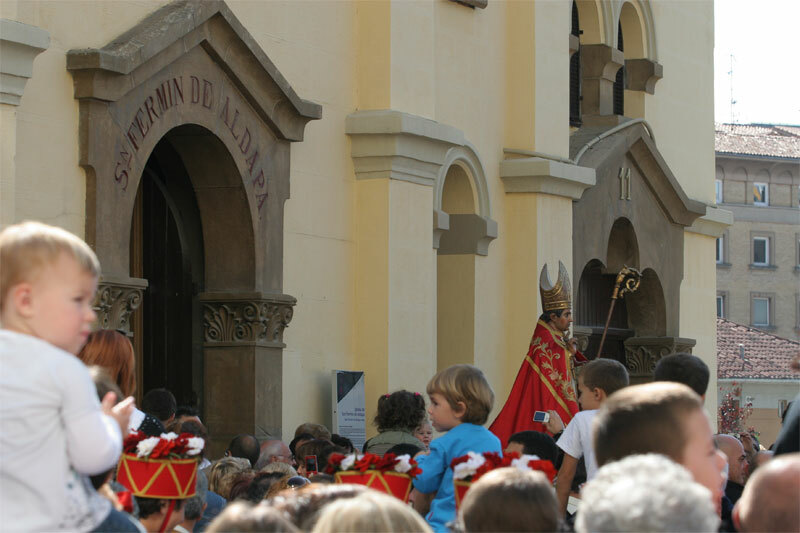 The Giants and their entourage – the Comparsa de Gigantes y Cabezudos – will accompany the image of the saint through the streets of the old quarter in company with the brass band, La Pamplonesa brass band, as well as the folk dancers, dantzaris de Duguna and of course the large crowds of people who always attend this event. The religious fiesta is celebrated hand-in-hand with the popular lay program of fiestas. Pamplona City Hall issues a program of events and there is another non-official list of events held by neighborhood groups within the old quarter of Pamplona. This non-official program is backed by several different associations grouped under the umbrella of the commission – Comisión de Fiestas del Casco viejo and their program is outlined at web page of Auzoenea. You can also download it here. Between the official city hall program and the non-official one there are sometimes some conflicts created as regards permissions and times and places for holding events. The non-official groups have a twitter blog created this year – the hastag #SFtxikitonEreBai and a web page at sanfermintxikito.wordpress.com where some popular people from the neighborhood express their point of view and support their program. 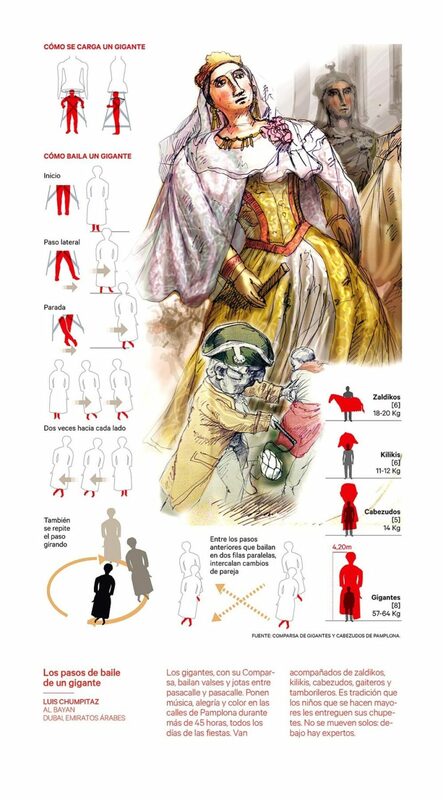 Meanwhile, Pamplona City Hall forms its own program which includes the parades of the Giants and their entourage – the Comparsa de Gigantes y Cabezudos of Sanfermin. In addition, they allow many establishments to remain open later and they adopt special street-cleaning safety measures. And as there are no one single program to be followed, some of the city’s discothèques also make special shows and offers for Sanfermin Txikito, such as the Sala Totem, Txuribeltz, the local folk dancers or the air open concer with The Coronas and the M.O.D.A. band at 23.00 on saturday night in the Burgos square. Errea Comunicación is the company which had been given the responsibility for the elaboration of the 2013 Sanfermin official program. 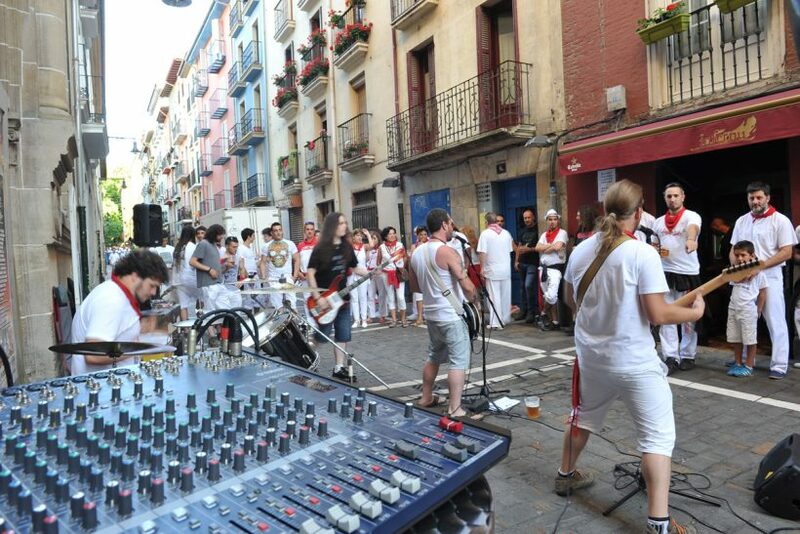 The company suggested to Pamplona City Hall that the habitual classic Sanfermin photographs of the fiestas should be substituted for computer graphics. Javier Errea, managing director of the company, stressed in the presentation of the program, that City Hall fully backed the novel idea. Errea stated that “Pamplona is the world capital for this type of design once a year (when it holds an annual competition for the Malofiej Awards- and this is the point that we wished to enhance to the Sanfermin program, which is a small annual sentimental treasure for all of us”. It meant two weeks of intense work to attempt to complete the proposals admitted by fifteen professional designers who are namely, Estudio Lamosca from Barcelona, Carlos Monteiro from Lisbon, Frederik Ruys from Amsterdam, Carlos Loscri from Buenos Aires, John Grimwade from Nueva York, Xaquín González from Nueva York, Fernando Baptista from Washington, Álvaro Valiño from Washington, Michael Robinson from London, Samuel Granados from Buenos Aires, Alessandro Alvim from Río de Janeiro, Jaime Serra from Barcelona, Jan Schwochow from Berlin, Luis Chumpitaz from Dubai and Pablo Errea from Pamplona.